Originally, Morgan was to be held at Loro Parque as an interim measure whilst the legality of her continued captivity was debated. The main consideration stated as to why she was sent to this facility, despite data to show otherwise, was so she could socialise with other orca. Following her transfer to Loro Parque, she was brutally and continually attacked by the orca held at Loro Parque. She was also subjected to excessive sexual pressure from a male orca who she was often locked into the same tank with (despite breeding not being authorised by her CITES Transport permit). The author of this status report (Dr Ingrid Visser), is experienced not only in wild orca research but has also observed orca in captivity in 12 facilities around the world, recorded data about Morgan for more than 77 hours, over eight days (spread over a 24 day period). During that time-fame, an unprecedented 91 aggression events were documented, all involving Morgan. A similar study at another facility, looking at aggression in captive orca (observing them for 1,872 hours, i.e., 78 days), recorded only eight aggressive episodes (once every 234 hours). Morgan, in comparison, when at Loro Parque, was attacked, on average, more than once an hour. Put another way, Morgan is over than 100 times more like likely to be attacked than the orca in the other study. 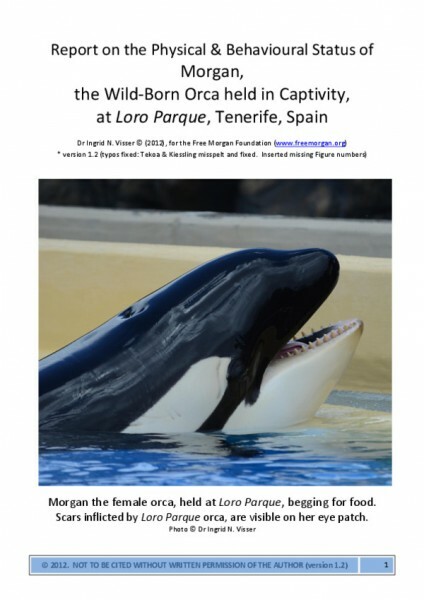 Between her arrival at Loro Parque and the publication of this report in June 2012, Morgan had been inflicted with more than 320 puncture and bite marks (all documented by photographs). This does not include the damage she had self-inflicted from abnormal and repetitive behaviours such as banging her head on the concrete tanks. Additionally, Morgan was wearing her teeth down from chewing on the concrete. Teeth wear in captive orca often leads to infections. These abnormal behaviours are a direct result of boredom and frustration from being held in a featureless environment, in which she is provided little if any stimulation. There is a clear lack of empathy for this animal from the trainers, who ignore her calls for attention and her cries for help and disregard aggressive attacks on her by the other animals, even when they are within meters of these events when they occur. Extracts of some of the photographs (with their original captions) are below. Our evidence focuses on how mistreated Morgan is at Loro Parque and how detrimental this is to her health. We include photographs showing her being rammed, bitten and attacked (see some examples below). Our reports are based on more than 77 hours of observations on Morgan. Although Loro Parque will claim that these attacks are ‘normal’, you can read in the supporting letters from orca scientists, that this is not the case, particularly in the wlid. In a comparative study, of captive orca, who were observed for 78 days (not hours! ), only eight events involving aggression were recorded. This is in comparison to the 91 attacks observed which involved Morgan.